DIS is designed and manufactured state-of-the-art door interlock/access systems for clean rooms, containment suites, laboratories - in fact any critical area that requires door access control with additional security. It is an USER PROGRAMMABLE Door Interlock System, This system is designed to suit modern door interlocking requirements. It can also be interfaced with any access control system. DIS has Master-Slave Configuration and can be configured upto maximum 8 doors in one loop. It has the provision for emergency situation like fire etc. so as to release the door and also other provision like "door Open too long" and "Door Force Open". smartELEVATOR is a weigand based intelligent 32 floor Lift Control System that offers security & convenience. It can be used to control the access to the levels in the building. It uses the SEVIO16 lift controller to control the access to each of the floor. Each card holder is assigned with a floor/s number setting which contains the information on how he/she can access to each of the floor. You may configure that the card holder only able to access to a certain levels but denied entry into others. In this way, the accessibility of the card holder into each of the area including control inside the lift can be managed from a single point. All settings including Card numbers (User ID), Templates, Door Output operating time & Real time clock can be downloaded/ uploaded from/ to the host computer. The system can be configured by using LCD keypad too without using PC (Software Utility). Can be interfaced with any access controller. Fire input on master - On receiving Fire input from Fire Panel, all the locks connected to slaves in loop with Master, will get released. Emergency Switch - On pressing Emergency switch on any of the DIS switch plate, all the lock connected to slaves in loop with Master, will get released. 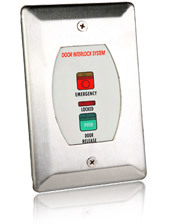 Door Plate with 3 LEDs to indicate Status of the door (Door Release, Door Locked & Emergency activated). Programmable Interlock Logic using Simple DIP Switch for Onsite Programming. Buzzer O/p for DOTL, Door Force Open and emergency, fire alarms.